When you’ve pass your driving test that’s it - you’re out on the road alone, right? Not if you download Confused.com’s Motor Mate app. It is advertised under the insurance company’s “Good Drivers” scheme as aiming “to make you a better, safer, more confident driver.” It certainly does that, especially when you’re aware of it and so watch your speed and braking that little bit more. Although if you’re anything like me and get lost easily, you have to have Sat Nav in your car too. These two together make you feel like you’re on a driving lesson every time you get in the car - except without the friendly banter of actual person sitting beside you! But enough about how my lousy sense of direction, which allowed me to notch up the required 250 miles you need to access the full app faster than Jenson Button around Silverstone - you’d rather know how Motor Mate works and how it can benefit you, right? You turn it on when you start a journey and it uses GPS to track where you are and how you’re driving. The main things the app focuses on are your steering - how smoothly you steer around corners - your braking - how progressively and early you brake - and the all-important factor of speed. At the end of each journey, the app will give a mark out of 5. 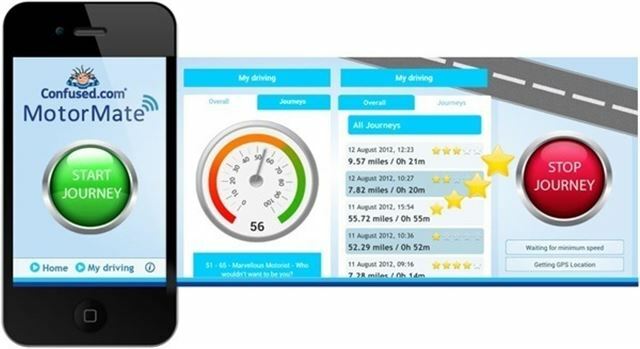 Unfortunately, this app isn’t completely like a driving instructor, as it doesn’t give you an evaluation of how you drive on each journey. So you’re not entirely sure of how to improve the next time you get behind the wheel. However, Confused.com do give you little incentives to keep using their app. Once you’ve driven 25 miles using it, they send you a free in-car charger and phone holder. And, once you’ve hit the big 250 miles, you will then be given a breakdown of your driving style. Plus they’ll e-mail you with your weekly results to let you see how you can polish your skills up that little bit more. I scored 51 on my first breakdown. According the app, this makes me a “Marvelous Motorist,” with my Confused.com MotorMark being above average. My journeys are well driven, consisting mostly of smooth and consistent manoeuvres, and “good levels of speed awareness.” But, like most things there’s still room for improvement. So, I’ll keep using the app to better my driving all the time. And, Motor Mate is the app that just keeps on giving. As well as receiving the breakdown after 250 miles, Confused.com also rewards you with £25 cashback if you buy insurance from them before 31st July. You could almost see this app as a trial for a “black box” tracking device, which measures how often you drive, when you drive and, of course, your driving style. Telematics systems can significantly reduce insurance costs, but are can be offputting so this system gives a ‘try before you buy’ option. You can read Charlotte’s driving lesson diaries in our Young Drivers section by clicking here. You complete star Charlotte, really informative.